Very pleased with the finished product. Happy to recommend Matrix to anyone. Great company with great attitude! Pleasure to work with, high quality premium product delivered as promised. Every step of the process was handled with care and attention. Starting with an estimate to the actual work by every crew. Steve and Joe were fantastic to work with as project managers and coordinators that would instantly answer and alleviate all of my concerns and address them as needed. Absolutely recommend them to others looking for a premium product. Our first visit with Ed L this weekend to discuss and design finishing our basement was exceptional. Ed was very professional, created a great design for our basement which included designing a mini kitchen, bathroom, 2 bedrooms and a great room. Ed answered all of our questions and helped us review our options which made making our decision easier especially after reading other reviews on their website. The product is perfect for our needs and the installation process looks easy. It is nice to see a company that knows what they do best and sticks to it. Amazing! We had Edward L make a presentation this weekend for a basement finishing system. We had a couple of other companies present their ideas for converting the basement. By far he explained the process better and took away the smoke and mirrors that comes with a project of this depth. Both my wife and I were extremely pleased with his knowledge and the detail of capturing just what we needed to make a decision much easier. Salesman Drew was extremely polite very thorough and explained in detail how he came up with his drawings!!! We were very impressed with the Matrix system and all of the various trade workers. You all did an excellent job and we highly recommend Matrix Basement Systems! I had an amazing experience with Matrix. All of the workers were punctual and professional. They did amazing work, and they even came back weeks later to help me with a project! We now have a gorgeous basement that we use every day. Matt and Nick came by on relatively short notice and spent a lot of time with my wife and I going over designs on first visit. The suggestions were fantastic and their portfolio is impressive. They have some great solutions for dealing with water, and they went over everything in very good detail. On top of all that, they were very easy to talk to and work with. They weren't very pushy and worked with us on financing. 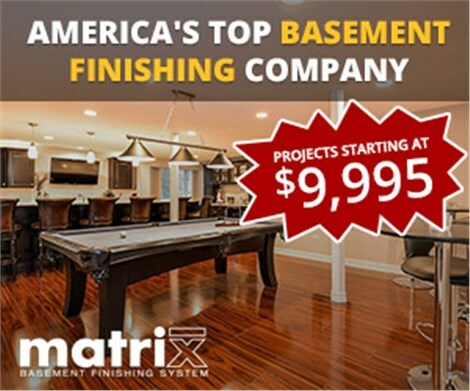 I highly recommend Matrix for your basement finishing needs. My girlfriend and I had Matt come in and give us a quote for our basement. We had no idea what we would all learn from this visit but Matt was excellent. He was very professional and gave us all the information that we needed and then some! We unfortunately were not able to provide Matt with our business today due to finances, but we look forward to that opportunity in the future. This is a rating for the first contact with Matrix Basement Systems. The sales rep. Dan was prompt and professional. After listening to our ideas and wants, he inspected our basement and took measurements and pictures. He was knowledgeable and explained what could be done and on what timetable we were looking at. We signed up for their service, and are anticipating a great outcome.